Welcome to the Fit Small Business QuickBooks Online training course! 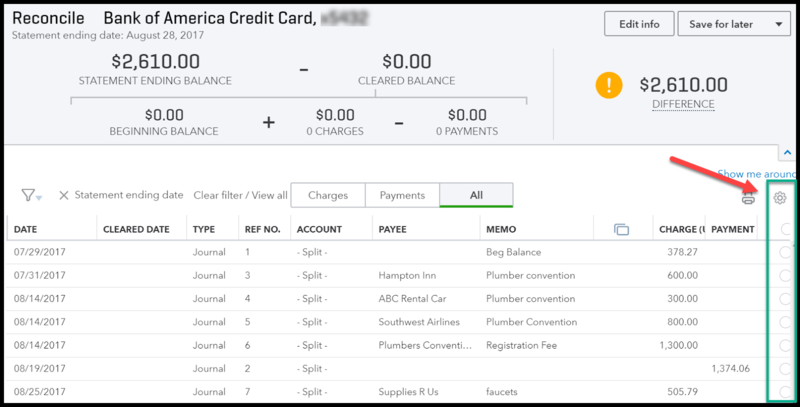 In this lesson, we’re going to cover how to reconcile business credit card accounts in QuickBooks Online. Why is Business Credit Card Reconciliation Important? Similar to your personal credit card accounts, it is important that you reconcile your business credit card accounts on a monthly basis. Reconciling is the process of matching the transactions on your credit card statement to what you have recorded in QuickBooks. Timely notification of any fraudulent transactions. For example, if you notice transactions listed on your credit card statement that you did not authorize, you can notify the bank as soon as possible so that they can investigate. In addition, reconciling your credit card transactions in QuickBooks helps ensure every transaction is noted in your books. This helps keep your financial statements, like profit & loss and balance sheet up-to-date. How Do I Reconcile Business Credit Card Accounts in QuickBooks? Before you follow the steps to reconcile, be sure that you have your credit card statement handy for the credit card that you want to reconcile. We will refer to the credit card statement often during this process. From the Home page, click on the Gear icon to the left of your company name. Below the Tools column, select Reconcile as indicated below. Step 2 – Select the Credit Card account you would like to reconcile. Complete the fields as indicated below. Account: Select the credit card account you would like to reconcile from the drop down. Beginning balance: QuickBooks will automatically populate this field with the ending balance from the previous month. Tip: Double check to make sure that the beginning balance here matches the beginning balance on your credit card statement. If it does not, you should see a notification similar to the one below. Click on the “We can help you fix it” link and follow the instructions to resolve the difference before you reconcile the current month. Ending balance: Enter the ending balance that appears on your credit card statement in this field. Ending date: Enter the ending date of your credit card statement in this field. 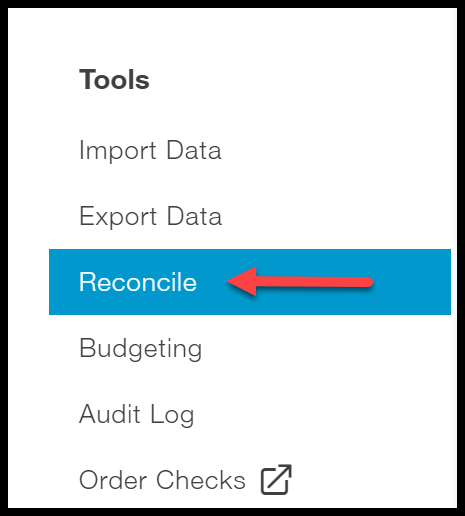 Start reconciling: When you are ready, click the “Start reconciling” button to go to the next step. Below you will find a screenshot of the new & improved reconciliation tool along with a brief overview. Statement Ending Balance – The amount that you entered from your credit card statement in Step 2 will appear in this field. Tip: Be sure to doublecheck this because it will cause you to be out of balance if it is incorrect. Beginning Balance – As discussed previously, this is the ending balance from last month’s statement. QuickBooks will populate this field for you. Cleared Balance – As you start to reconcile each item, this amount will change depending on whether you have selected a charge or a payment transaction. Charges – This amount will increase as you select charges to reconcile from the detailed section below. Payments – This amount will increase as you select payments to reconcile from the detailed section below. Difference – This field is automatically calculated. It is the difference between your statement balance and the cleared balance. The goal is to get to a difference of zero. Transactions – In this section, you will see all of the charges and payments that have been recorded in QuickBooks as of your statement ending date. 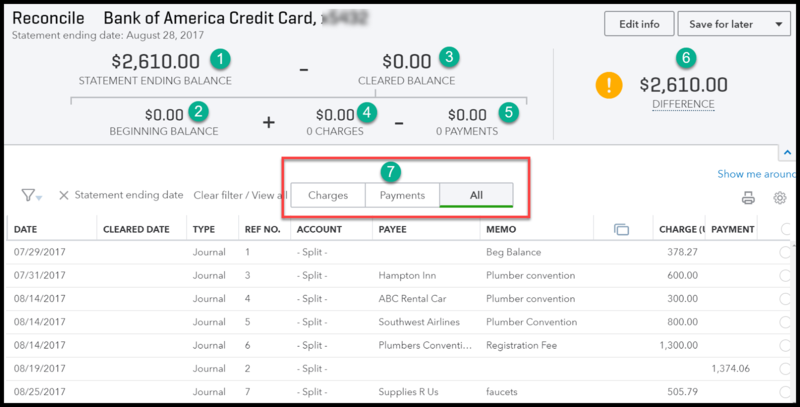 You can filter this section to just show Charges, Payments or all by clicking on each of the tabs as indicated in the screenshot above. If you are new to reconciling, I recommend that you reconcile the area with the least number of transactions first. Our goal is to make sure that every charge and payment listed on the credit card statement is marked as “cleared” in the reconciliation window. To mark an item as “cleared”, click the radio button to the right of the Payments column as indicated in the screenshot below. Let’s start with payments first. Once you have marked all of the payments in this window that appear on your credit card statement, verify that the total payments cleared matches the total payments amount on your credit card statement. In the example below, total payments on our credit card statement ($1374.06) match the total payments we have “cleared” in QuickBooks ($1374.06). If it does, you can move onto charges. However, if your payments do not match, head over to the section for troubleshooting tips on how to fix the out of balance. Repeat the same steps for all charges. Make sure that the total charges cleared in QuickBooks matches your credit card statement. In the example below, total charges on our credit card statement ($3505.79) match the total charges we have “cleared” in QuickBooks ($3505.79). If it does, you can move onto the next step; however, if your charges are not in balance, head over to our troubleshooting section for tips on how to resolve the out of balance. Once all charges and payments match the credit card statement, you should have a difference of $0.00 as indicated in the screenshot below. Behind the scenes, QuickBooks will mark all of the charges and payments that have been reconciled as cleared. Click the “Finish now” button to generate the credit card reconciliation report which we will look at next. Here is a snapshot of the credit card reconciliation report that QuickBooks will generate. Tip #1: It’s important that you save all credit card reconciliation reports for every credit card account. You can create a folder for each credit card account to keep these reports in. For more tips on how to organize key financial reports and documents, check out our Small Business Bookkeeping Guide. Tip #2: Bank/credit card reconciliation reports are one of the Top 5 reports that auditors will request from you during an audit. In my experience as an auditor, if you are not able to provide these reports the audit may not go well for you. If possible, narrow the search down to the transaction type. Figure out if you are out of balance with the charges and payments. If you are out of balance for both charges and payments, then tackle them separately. In other words, balance charges/cash advances first and then move onto payments/credits or vice versa. Look for the exact dollar amount that you are off. For example, if your difference is $50.00, then look for a transaction for this amount on your credit card statement and then on both the charges section and payments section of the reconcile window. Triple check the information that you entered from the credit card statement in step 2 above. Check to see if there are any transactions in the reconcile window that you did not select. If the transaction is on your credit card statement, then make sure the radio button next to it is selected. For a missing charge, enter it as you normally would. In our how to manually enter business credit card transactions lesson, we walk you through step by step on how to enter credit card transactions in QuickBooks. If the missing transaction is a payment, enter it as you normally would. In our how to enter credit card payments/refunds lesson, we walk you through step by step how to enter credits in QuickBooks. Take a break. If you have been at it for a while and you need a break, clicking the Finish Later button as indicated above will save the work you have done so that you can easily pick up where you left off. Sometimes, taking a breather and coming back can help you spot what’s causing the difference. While it might be tempting, I recommend that you don’t click that reconcile button until you have a difference of $0.00. The problem will not go away. The difference will just carry over to the next month until you figure it out. 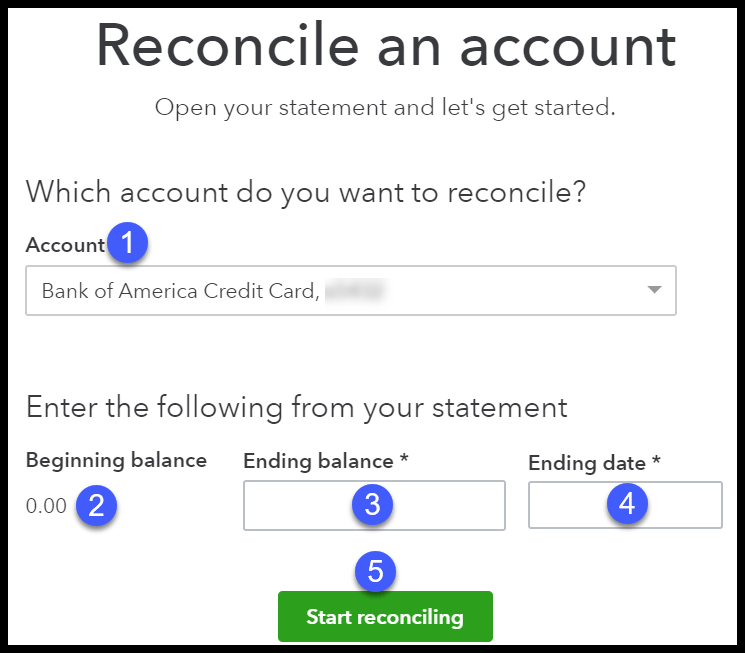 If you do hit the reconcile button and you have not figured out the difference, QuickBooks will record the out of balance amount in a miscellaneous expense account called unreconciled discrepancies. Of course, if we are talking a small amount (i.e. $5.00 or less), then it might be worth your while to move on. At the end of the day, you get to determine what amount you are comfortable with. What Impact does Reconciling Credit Card Accounts Have on My Financial Statements? Reconciling your credit card accounts does not change your financial statements. However, in the credit card register, reconciled charges and payments will be indicated with the letter “R” as indicated below. TIP: Typically, once a credit card transaction is reconciled, you do not want to make any changes to it. This is primarily due to the fact that you have balanced it with your credit card statement. You can edit the account if you need to (i.e. if you categorized something as meals and entertainment, and it should have been office supplies), but you do not want to make any changes to the date or the amount. If you do, it can cause your financial statements to be inaccurate and you will no longer be in balance with your credit card company. That wraps up the section on How to Reconcile Business Credit Card Accounts in QuickBooks Online. The next lesson in our QuickBooks Online Training Course will be How to Manage Credit Card Sales with Intuit Merchant Services. In this lesson, we will walk you through a few options for credit card processors and the most efficient way to accept credit card payments in QuickBooks.